In a self-righteous, moralizing speech in Michigan last week, right wing radio personality Linda Harvey blithely offered this gem when questioned about discrimination against LGBT partners who want to marry. “They can still marry someone of the opposite gender,” Harvey said. This flippant response was not surprising. Self-styled “family values” activists have long turned a blind eye to the destruction caused by such “arranged” marriages. There are support groups, such as The Straight Spouse Network and Gay Husbands/Straight Wives, to pick up the pieces after these unions implode. If Harvey and others of her ilk were genuinely concerned about the health of LGBT couples, they would be in favor of allowing them to marry. Instead, such hypocrites smugly mask their contempt with transparently saccharine professions of concern. They even offer “help” for LGBT people who are unhappy — while simultaneously working to undermine relationships that might bring joy. Is this not a conflict of interest? Homosexuality is not a habit, of course, while homophobia is. Indeed, this preoccupation with prejudice by religious extremists directly affects several of these key measures of health. Every time an LGBT person is rejected from his or her house of worship, this has a tangible impact on their social status. When gay and lesbian couples are taxed at discriminatory rates it affects income. One would think that priggish proselytizers such as Harvey would read these alarming statistics and oppose bullying in schools. Instead, her organization, Mission America, is dedicated to attacking the “Day of Silence,” an annual event where students remain quiet for a day to show their support for LGBT peers. Is there any room for finding homosexuality‚Äîdare we say it‚Äîrepulsive? Or is that response now going to be viewed as “hate”? Is a student allowed to say a firm “no” to a homosexual advance? So, the unctuous Harvey is concerned for our health, but portrays LGBT teenagers as repulsive predators with a furtive political agenda. I’d hate to see what Harvey is capable of saying if she did not love us so much. 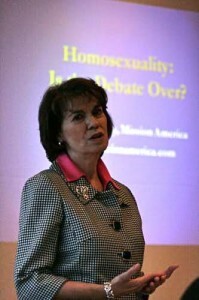 Harvey also prattled on in her presentation, and website, about the supposed dangers of homosexuality – particularly contracting HIV. Not surprisingly, Harvey actively promotes abstinence-only “education” in schools, which is proven to be ineffective. She recklessly presents HIV as a gay disease — when it can be contracted by anyone who fails to take adequate precautions. It is important to note that even if a gay man contracted HIV today, he still might outlive judgmental religious extremists who are so quick to condemn. Bible-Belt states are generally the fattest, have the highest concentration of smokers, have the most divorces and are even more likely to have traffic accidents due to aggressive driving. While these busybodies worry about our hearts and happiness, their own children may one-day die prematurely of heart attacks by inhaling Happy Meals. In conservative areas, the fast food drive-thru might as well be a drive-by-shooting. Isn’t it time our foes stopped obsessing about narrow-minded “morality” and spent more time addressing their own mortality caused by gluttonous and destructive lifestyles? Averting their obsessive gaze from the gays to focus on their own families is quintessentially a “pro-life” position.